1 The cast from AMC's series "Breaking Bad" poses backstage with their awards for Outstanding Drama Series at the 65th Primetime Emmy Awards in Los Angeles, Sept. 22, 2013. 2 Julia Louis-Dreyfus, winner of the Best Actress in a Comedy Series, and Tony Hale, winner of the Best Supporting Actor in a Comedy Series, celebrate at the 65th Primetime Emmy Awards HBO after party in West Hollywood, Sept. 22, 2013. 3 Actress Claire Danes accepts the award for Outstanding Lead Actress In A Drama Series for her role in "Homeland" from presenter Jimmy Fallon at the 65th Primetime Emmy Awards in Los Angeles, Sept. 22, 2013. 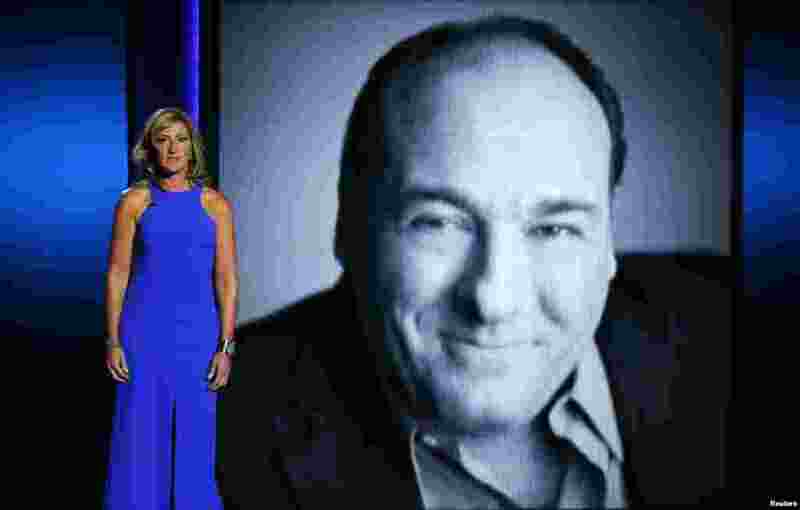 4 Actress Edie Falco gives a tribute to late actor James Gandolfini at the 65th Primetime Emmy Awards in Los Angeles, Sept. 22, 2013.